If there were prizes given out to the Dinosauria for being the most successful in terms of species known and geographical distribution, then the primitive horned dinosaur Psittacosaurus would very likely be up for an award. To date, something like ten species or so have been named and fossils of these early Ceratopsians have been found over a vast area of Asia, from north-eastern China through to central Russia. Our knowledge of Psittacosaurs is likely to be increased thanks to the discovery of what is believed to be an almost complete specimen, excavated from Cretaceous aged sediments near to the village of Shestakovo (Chebulinsky district). In a press release from Russian news agencies and the Kemerovo Regional Museum, Olga Feofanova (Director of the Kemerovo Regional Museum), explained that the dinosaur fossil specimen had been discovered at a well-researched and studied fossil dig site that has yielded a number of vertebrate specimens in the past, including a several examples of rare Cretaceous mammal fossils. This particular Psittacosaurus was discovered after three weeks of careful excavation. The fossil material is still entombed in the surrounding rock. The block of stone was carefully removed and will be stored at the Kemerovo Museum and made ready for display. A spokesperson for the Museum commented that it might take up to six months to extract the fossilised material from the surrounding matrix. The Russian scientists are confident that their specimen represents a Psittacosaurus sibiricus, a species of Psittacosaurus which is known from a complete skull and the majority of the skeleton, found in 120 million year old rocks at locations in central Russia and Siberia. This new fossil discovery may prove to be the most complete P. sibiricus fossil found to date. Olga Feofanova added that the finding of this new fossil, believed to represent an individual dinosaur that was more than two metres long, will make it possible to conduct a comparative analysis with other Psittacosaurus sibiricus fossils to help palaeontologists learn more about how these dinosaurs grew (ontogeny). A number of museums and universities have been examining how Psittacosaurs changed as they grew and matured. For example, last year, Everything Dinosaur reported on research conducted by the University of Bristol, the Institute of Vertebrate Palaeontology and Palaeoanthropology (Beijing) and Bonn University which examined how the stance and locomotion of Psittacosaurs changed as they got older. An illustration of the head of P. sibiricus. This psittacosaurid had a broad, deep snout and size estimates vary between 1.5 metres and 2.5 metres in length. With fossil finds all over Asia, these relatively small and lightweight dinosaurs were extremely successful. A number of remarkable fossil finds have been made over the years, back in September 2007, Everything Dinosaur team members reported on a Psittacosaurus fossil discovery that suggested that these dinosaurs looked after their young in collective nurseries. It is good to hear about a dinosaur whose fossilised remains will most likely be going on display in a museum quite close to where the fossils were found. This week saw the 200th anniversary of the first scientific description of an animal that was later named as an Ichthyosaur. On June 23rd 1814, Sir Everard Home published the first account of the Lyme Regis Ichthyosaur that had been found a few years earlier by the Anning family (Mary and her brother Joseph). The paper was published by the Royal Society of London, it had the catchy title of “Some Account of the Fossil Remains of an Animal More Nearly Allied to Fishes than any Other Classes of Animals”. In the account, Sir Everard Home, an anatomist who held the distinguished position of Surgeon to the King, attempted to classify the fossilised remains of what we now know as a “Fish Lizard”. Reading the paper today, one can’t help but get a sense of utter confusion in the mind of the author. Sir Everard, had one or two secrets and although two hundred years later, it is difficult to place in context what was behind the paper, after all, at the height of the Napoleonic war there was intense rivalry between the French and English scientific establishments, an assessment of this work in 2014 does little to enhance Sir Everard’s academic reputation. Back to those secrets. Whilst notable figures in the history of palaeontology such as the Reverend William Buckland was corresponding with Georges Cuvier, the French anatomist and widely regarded as “the founder of modern comparative anatomy”, against a back drop of war between Britain and France, in a bid to understand the strange petrified remains found on England’s Dorset coast, Sir Everard raced into print, to be the first to describe this creature. Just like today, if you are the first to do something than fame and fortune can await. Trouble is, Sir Everard, by a number of accounts, was relatively incompetent. He was also a cheat! In 1771, when the young Everard was a teenager, his sister married John Hunter, an extremely talented surgeon and anatomist who had already built a reputation for himself as being one of the most brilliant scientists of his day. He was able to learn a great deal from his brother-in-law and this coupled with his wealthy background soon propelled the ambitious Everard to the forefront of London society. However, the much older John Hunter died suddenly from a heart attack in 1793 and it has been said that Everard used his brother-in-laws untimely death to his distinct advantage. Having removed “a cartload” of John Hunter’s unpublished manuscripts from the Royal College of Surgeons in London, Everard began publishing them but under his own name. This alleged plagiarism enhanced the young surgeon’s reputation and led to his steady rise in scientific circles, permitting Everard to gain the fame and good standing amongst his peers that he so craved. Such was his desire to keep his plagiarism a secret, that it is believed that he burnt Hunter’s original texts once they had been copied out. So enthusiastic was he to get rid of the evidence that on one occasion he set fire to his own house. In the paper, Sir Everard describes the fossil remains in some detail, although his descriptions lack the academic rigour found in other papers later published by Cuvier, Mantell and Owen. The author states that the fossil material was found in the Blue Lias of the Dorset coast between Charmouth and Lyme Regis, the fossil discovery having been made after a cliff fall. The paper claims that the skull was found in 1812 with other fossils relating to this specimen found the following year. The role played by the Annings in this discovery is not mentioned by Home. This assertion itself, may be inaccurate. Many accounts suggest it was Joseph Anning who found the four foot long skull in 1811, as to whether Mary was present at the time, we at Everything Dinosaur remain uncertain. Although Mary and Joseph together are credited by many sources for finding other fossil bones related to this specimen in 1812. The potential mix up in dates, pales when the rest of Sir Everard’s paper is reviewed. At first, the idea that these bones represent some form of ancient crocodile is favoured. Embryonic teeth ready to replace already emerged teeth were noticed. However, to test this theory one of the conical fossil teeth was split open. He mistook evidence for an embryonic tooth ready to replace a broken tooth in the jaw as an accumulation of calcite and hence, Everard wrongly concluded that this creature was not a reptile. The sclerotic ring of bone around the eye reminded the anatomist of the eye of a fish, but when the plates were counted that make up this ring of bone (13), he commented that the fossil may have affinities with the bird family as this number of bones is found only in eyes of birds. The position of the nostrils and the shape of the lower jaw is considered to be very like those seen in fish. The freshwater Pike is mentioned, although there are other parts of the skeleton that seem to confuse Sir Everard still further. The shoulder blades both in their shape and size are reported as being similar to those found in crocodiles, part of the fossil material is even compared to the bones of a turtle. One of the illustrations by William Clift. Our baffled author had described a few years early the Duck-billed Platypus (Ornithorhynchus anatinus) after specimens were brought back from eastern Australia. Sir Everard is referring to the Platypus when he writes of “those animals met with in New South Wales”. Much of the French scientific establishment (and a significant number of British scientists) pilloried this paper. The difference being, the French who were at war could do it openly, however, in Britain, such was the power and influence of Sir Everard Home, no one dared challenge his assumptions openly. It was perhaps because of Sir Everard’s influence and strong standing within the Royal Society, that the Reverend William Buckland along with the Reverend Coneybeare supported by up and coming geologists such as Henry de la Beche published a rival scientific paper on the Annings’s discovery in the journals of the Geological Society. This paper correctly identified that the fossils were reptilian. Sir Everard, although ridiculed by other academics continued to work on the puzzling Ichthyosaur specimens. Five years after his 1814 paper, he thought he had finally solved the mystery as to this strange creature’s anatomical classification. A new vertebrate to science, referred to as a “Proteus” had been described by a Viennese doctor some years earlier. This was a blind, amphibian of the salamander family (Proteus anguinus) that lived in freshwater streams and lakes deep in caves. Sir Everard mistakenly concluded that the Lyme Regis fossils were a link between the strange Proteus and modern lizards. From then on he referred to the 1814 specimen as a “Proteosaurus”. However, this name never was accepted by scientific circles as the moniker Ichthyosaurus (Fish Lizard) had been erected a year earlier by Charles Konig of the British Museum where the Ichthyosaur specimen resided. Ironically, as our knowledge of the Ichthyosaur Order has grown over the years, so the Lyme Regis specimen has been renamed. It is no longer regarded as an Ichthyosaurus, as the fossils indicate a creature more than five metres in length, much larger than those animals that make up the Ichthyosaurus genus today. In the late 1880’s it was renamed Temnodontosaurus (cutting tooth lizard). The Lyme Regis specimen, studied all those years earlier by Sir Everard Home, was named the type specimen with the species name Temnodontosaurus platyodon. An Ichthyosaurus with an Ammonite that it has caught. The 1814 paper might say more about the petty rivalries and snobbery that dogged British scientific circles than it adds to our knowledge of the Ichthyosauria. However, there is one final point to be made. Accompanying the notes were brilliant illustrations of the fossil material, carefully and skilfully prepared by the naturalist William Clift. The child of a poor family from Devon, William had shown a talent for art from a young age. His illustrative skills were noticed by one of the local gentry, a Colonel whose wife happened to know Anne Home, the sister of Everard who had married John Hunter. When John Hunter was looking for an apprentice to help classify and catalogue his growing collection of specimens at the Royal College of Surgeons, Clift was recommended. He quickly rose to prominence and despite being hampered by the removal of many of John Hunter’s manuscripts by Everard, Clift’s reputation grew and grew. His daughter, Caroline Ameila Clift married Professor Richard Owen (later Sir Richard Owen), the anatomist who is credited with the naming of the dinosaur Order and the establishment of the Natural History Museum in London. Safari Ltd have introduced a replica of an Ammonite into their Wild Safari Dinosaurs model range. This model series certainly has a lot more than just dinosaur models to offer collectors and this new Ammonite replica is a welcome addition. In this short video review (six minutes and twelve seconds long), Everything Dinosaur discusses the merits of this model and explains why its introduction will prove very helpful to teachers and fossil collectors. Although the soft parts of members of the Ammonoidea are virtually unknown in the fossil record, this replica reflects what palaeontologists actually think that the soft tissues of Ammonites looked like. From the front the animal looks quite foreboding with its two long tentacles and eight muscular arms. Imagine how you would feel if a three metre long specimen came hurtling towards you out of the dark waters – very scary! This Ammonite model is great for use in schools as a teaching resource and it will also find a role in helping to explain Ammonite fossils in museum display cases. With the introduction of the second Papo prehistoric animal figure for 2014, it is time to get the camcorder out again and to produce a video review of this new addition to Everything Dinosaur’s range. In this short video, we reveal a surprise about this dinosaur model and comment on how this replica reflects the known Dilophosaurus fossil material. The video lasts for five minutes and ten seconds, we examine the model in a little more detail. Naturally, the Everything Dinosaur team members focus on those bizarre crests, after all, the name Dilophosaurus does mean “double crested lizard”. The pose of the model is discussed as is the colouration, on what is an excellent new addition to the Papo prehistoric animals model range. There may be a year or so before the premier of the new Jurassic Park film (Jurassic World), but already there has been intense speculation about which sorts of prehistoric animals are going to feature in the fourth movie in the JP franchise. Visitors to Everything Dinosaur’s Facebook page will have seen snippets about “Diablo rex“, a genetically modified, super-predator which is going to feature, look out for a general release date of around June 12th, 2015. In the original Jurassic Park film based on the Michael Crichton novel, frog DNA was used to complete the genome and DNA sequencing that led to the creation of the dinosaurs. It seems in the forthcoming, “Jurassic World”, this work has been continued further, leading to dinosaur DNA being mixed with the genes of other reptiles and Cephalopods to create a fearsome predator with chromatophores in its skin, giving this beastie the ability to camouflage itself amongst its surroundings – nasty! Director Colin Trevorrow has been adding to the fervent speculation as last week he tweeted a picture of the silhouette of a huge set of jaws onto his Twitter account. Apparently, during a break in the filming, Colin took an intriguing snap shot of the shadow cast by the huge, teeth-lined jaws of one of the dinosaur stars. The picture, simply entitled “Nights” seems to show a shadow cast by street lights. Tantalising glimpse of dinosaur in forthcoming movie. The conical shaped teeth of what evidently is a carnivore can be clearly made out and although the photograph is deliberately misleading (good old Hollywood PR machine in play), our dinosaur experts have been trying to shed some light as to what the picture actually reveals. Firstly, the photograph gives the impression that the two jaw bones are of very different sizes, with one jaw looking three times thicker than the other. Such a difference in jaw thickness between the dentary of the lower jaw and the maxilla is not unknown in the Dinosauria. Both the abelisaurids and the tyrannosaurids exhibited such characteristics with the lower jaw (dentary) being less thick than the upper jaws in many cases. There are certainly a large number of teeth depicted. The teeth in the thin jaw are almost Crocodilian in shape and number, or should we describe the dentition and their numbers resembling an example from the Spinosauridae. Spinosaurs had long, pointed conical teeth very similar to today’s Nile Crocodile (Crocodylus niloticus). On first impression the jaws don’t look very much like the typical jaws of a Tyrannosaurus rex that’s for sure. Interestingly, when the picture is rotated through 180 degrees, the thin jaw element becomes the lower jaw. The shadow cast looks almost Crocodilian. The image rotated through 180 degrees. In this view the photograph reminds us of the head and jaws of the Triassic carnivore, Postosuchus, a reptile but not a member of the Order Dinosauria. A model of Postosuchus from Safari Ltd. In the upside down picture, two triangular bumps can be seen on what would be the top of the upper jaw. Could these be nose horns? Is Colin really toying with us, is the picture he posted actually a clever shot that when turned the other way up reveals more about this prehistoric animal? Addendum, the newly created dinosaur in the film is called Indominus rex. A study of the skulls of a Late Jurassic dwarf Sauropod whose fossils have been found in Germany, has thrown up some intriguing questions about how Sauropods came to be small. 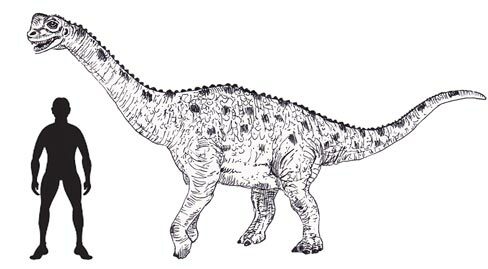 Sauropods were herbivorous, saurischian (lizard-hipped), dinosaurs with small heads, long necks, massive bodies and long tails. As a group, they evolved sometime in the Late Triassic and survived until the very end of the Age of Reptiles. Typical well known Sauropods are the likes of Diplodocus, Apatosaurus and Brachiosaurus, some genera of the Sauropoda represent the largest land living animals known to science. However, with the Sauropoda, big is not always beautiful. This new research, published in the “Journal of Systematic Palaeontology”, focuses on a dwarf, a dinosaur named Europasaurus (E. holgeri), which although related to the likes of Brachiosaurus was substantially smaller. The study suggests there were actually two dwarf forms of Europasaurus. In 1998, the fossilised remains of a group of Sauropods was discovered in a limestone quarry in Lower Saxony (Germany). At first, these fossils, thought at the time to represent at least eleven individuals, were considered to be a group of baby dinosaurs. However, later studies proved that the largest of the dinosaurs found were adults and fully grown. The fossils represented dinosaurs that ranged in size from Shetland pony size up to around six metres in length. Europasaurus was classified as a dwarf member of the Brachiosauridae family, closely related to enormous dinosaurs such as Lusotitan from Portugal, but much smaller in stature, with even the very biggest specimens weighing no more than a tonne. How did these relatively small dinosaurs evolve? The most widely accepted theory, one that is backed up with observations amongst living vertebrates today, goes like this. Once upon a time, back in the Kimmeridgian faunal stage of the Late Jurassic (around 154 million years ago), much of Europe was underwater. There was an archipelago of small islands off the coast, this land had been part of the mainland but rising sea levels had isolated it and left a string of islands as the only landmasses surrounded by a warm, tropical sea. Dinosaurs cut off from the mainland adapted to their new island homes by becoming dwarf forms of their mainland cousins. These islands had limited food resources and so the Sauropod population slowly evolved into miniaturised forms. Skull fossils of Sauropods are exceptionally rare in the fossil record. Those small heads tend to fall off the long necks when the animal dies and the body begins to rot. Very few skull fossils of Sauropods are known, so the bone bed of Europasaurus fossils with perhaps as many as fourteen skulls of various sizes to study would be an ideal place to start when looking into how the heads of dinosaurs changed shape as they grew and matured. This is exactly what a the team of scientists based in the University of Bonn set out to do in collaboration with colleagues from Argentina. Looking at how skull shape of Sauropods change as they grew. The diagram above shows the skull of an adult Europasaurus drawn in (A) lateral view, (B) viewed from the back and (C) in dorsal view, that is, seen from above. The research team identified that the skull morphology (shape) was most unusual. It seems that fully grown adults retained skull characteristics of juveniles. They had proportionately larger eye sockets and some parts of the skull bones were not fully fused. Intriguingly, this analysis confirmed the findings of an earlier study that looked at the collection of vertebrae (back bones) found in the quarry. The vertebrae study suggested that the Europasaurus fossils could be split into two, distinct groups – a small dwarf and a larger dwarf. The larger dwarves were up to 35% bigger than the smaller forms. Such small, thin samples allow researchers to examine the bones’ microstructure as the bone becomes translucent and can be studied under a microscope. Given the number of skulls fossils available to study, the team were able to plot changes in skull shape as the animal grew and developed. In total 123 skull bones were examined. However, the mystery of why there are two sorts of dwarf dinosaur remains. A number of theories have been proposed and team members at Everything Dinosaur have summarised them below, what do you think? We have two types of Europasaurus preserved in the quarry because one set of fossils represent males, whilst the other group are females. We have two types of Europasaurus preserved in the quarry because the fossils, all of which were washed out to sea, represent two distinct populations from nearby islands whose remains got caught in the same currents and deposited in the same location. We have two types of Europasaurus because the quarry has preserved two different populations, they both died in flood events and were washed out to sea but these events were separated by thousands of years. The bones in the quarry represent a range of individuals of different ages from youngsters to fully grown adults, with the medium sized dinosaurs (the teenagers and young adults) not present. Perhaps immature and young ,adult Europasaurus lived outside the herd in their own groups, as seen with young African elephant males today. Young male, African elephants tend to form their own herds away from the larger female dominated herd. Perhaps the bone bed represents two distinct species of Europasaurus (E. holgeri major and E. holgeri minor)? There could be other explanations of course, but this is a case of one palaeontology study raising more questions than it answers. The research team included Professor Martin Sander, the scientist who perhaps more than anyone knows most about this strange enigmatic German dinosaur. For it was Martin, who as a young researcher at the University of Bonn, who first recognised that the limestone quarry Sauropod fossils were not babies but represented a dwarf form and indeed, it was Martin and his colleagues who were responsible for formally naming and describing this genus back in 2006. This new research has contributed significantly to our understanding of how Europasaurus grew and developed. In addition, it is part of a bigger research project that sets out to explore how dwarfism can occur in the Dinosauria. It is likely that the fossils of Europasaurus will be involved in many more studies and the researchers are hopeful that further Sauropod remains will be found in the quarry and nearby sites in the future. A team of scientists from Flinders University (Adelaide, South Australia) and the Institute of Vertebrate Palaeontology and Palaeoanthropology (Beijing) have announced the discovery of a new genus of primitive fish from the Silurian aged deposits of Yunnan Province (south-western, China). There have been a number of ancient fish species described from Chinese excavations in recent years, but there has been nothing like this fish ever found before, for a start it is at least three times as big as any other Silurian vertebrate and it had a mouth and teeth designed for eating other marine creatures. This was the Silurian equivalent of Tyrannosaurus rex, an apex predator that swam in a warm, tropical sea some 423 million years ago. The prehistoric predator has been named Megamastax amblyodus, the name means “big mouth with blunt teeth”, one of the lead researchers and authors of the scientific paper on this new carnivore, Dr. Brian Choo, describes Megamastax as a member of the Sarcopterygians or lobe-finned fish, the group of jawed vertebrates that are believed to have given rise to the Tetrapods (four-legged, land animals and our own ancestors). Scientists now think that the Sarcopterygians evolved in the Late Silurian and rapidly diversified, out competing the jawless fish (the Agnathans). Fossils found in Yunnan Province in the late 1990’s proved that the Sarcopterygians did indeed have Silurian origins and they did not evolve in the later Devonian as previously thought, however, the discovery of a relative giant throws up some intriguing questions. For example, did the Sarcopterygians evolve earlier, or did they diversify extremely rapidly giving rise to a myriad of new forms including apex predators. Megamastax terrorises a group of jawless fish. Not only does this new fossil discovery change views on marine ecosystems, but it adds a twist to the current debate about the palaeoclimate of Earth. With only small vertebrates found, scientists thought that there was not enough atmospheric oxygen to permit the evolution of large back-boned animals. Megamastax would have competed with larger genera of Eurypterids (sea-scorpions) for food resources, some palaeontologists have argued that it was the evolution of large, jawed fishes that led to the demise of many forms of marine Arthropod, including the sea-scorpions and many types of Trilobite. The rocks that make up the Silurian deposits of Yunnan Province were formed in a shallow sea that made up part of the colossal Panthallassic Ocean that covered virtually all of the eastern hemisphere. Yunnan Province lay at the bottom of this shallow sea some more than a thousand miles west of its current location. Hypothetical silhouettes of M. amblyodus. The picture above shows pictures of the holotype jaw (IVPP V18499.1) in various views (A) lateral view, outside of jaw, (B) lingual (inside of the mouth view), (C) dorsal view, from the top and (D) close up of marginal teeth. Picture (E) shows a close up of the dentition if viewed from the inside of the mouth – lingual view. Figures F to H show views of the second partial jaw recovered (F = lateral, G = lingual, H = dorsal). Picture I shows the third jaw fragment (V18499.3) viewed from the side (lateral view). The drawings labelled J1 represents a genus of Silurian fish found in the same layer of strata as M. amblyodus, Guiyu oneiros, G. oneiros may have been the prey. Drawings J2 and J3 represent suggested silhouettes for this new Silurian predator, the smaller sized specimen (J2) is based on smaller jaw fossils, whilst J3 is based on the largest jaw fragment found. Co 1–4, coronoids 1–4; coT 1–8, coronoid teeth 1–8; De, dentary; fo.add, adductor fossa; fo.gl, glenoid fossa; fo.Mk, Meckelian foramen; Id, infradentary; mpl, mandibular pit line; maT, marginal teeth; oaMx, overlap area for maxilla and quadratojugal; Pat, prearticular; sym, area for parasymphysial plate; tr, indented track bordering splenial. Researchers have described a new genus of Ceratopsian, based on fossils excavated from Montana (western United States) and Alberta (Canada). The dinosaur has been named Mercuriceratops (M. gemini) and when fully grown, this heavy weight herbivore, would have weighed as much as an Asian elephant and measured around six metres in length. Mercuriceratops lived around seventy-seven million years ago (mid Campanian faunal stage) and the formal, scientific paper describing this new genus has been published in the journal Naturwissenschaften (the science of nature). Mercuriceratops (pronounced Murr-cure-ree-sera-tops), means “Mercury horned face”, this Chasmosaurine has been named after the wing-like protrusions on the side of its neck frill. The “wings” are formed from the squamosal skull bones which are hatchet shaped and stick out from the side in a much more prominent manner than in any other known species of Ceratopsian. In addition, the the back of the squamosal is modified to form a narrow bar that would have supported the side of a very robust parietal skull bone. These unusually shaped squamosals reminded the research team of the wings on the helmet of the Roman god Mercury. “winged” squamosal bones on Mercuriceratops. Related to Chasmosaurines such as Pentaceratops and Triceratops, the research team have proposed that this dinosaur too, had two long brow horns and a shorter nose horn, just like the later Chasmosaurine dinosaurs Pentaceratops and Triceratops. Two large horns over the eyes (brow horns) is very typical of the Chasmosaurinae. The picture above show models of typical Chasmosaurine dinosaurs, note the large horns over the eyes. The models are from the Schleich World of History Model series. The trivial or specific name – “gemini” refers to the almost identical fossil specimens that were found and led to the description of this new genus of horned dinosaur. One fossilised squamosal bone comes from Upper Cretaceous strata of north, central Montana, the second comes from rocks found in the famous Dinosaur Provincial Park Formation of Alberta. Mercuriceratops represents the oldest Chasmosaurine dinosaur known from Canada and the first pre-Maastrichtian Ceratopsian to have been found in both the USA and Canada. Recently, palaeontologists have begun to piece together a picture of the North American fauna in the Late Cretaceous. The fauna of Laramidia (the long, narrow strip of land that made up the western shores of the Western Interior Seaway), was extremely varied. This newly named dinosaur genus reinforces the biogeographical differences between the northern and southern faunal provinces of the Campanian of North America. Having said that, this dinosaur must have been quite wide ranging with something like 380 kilometres between the two fossil finds. The new dinosaur is described from skull fragments from two individuals collected from the Judith River Formation of Montana and the Dinosaur Park Formation of Alberta. The Montana specimen was originally collected on private land and acquired by the Royal Ontario Museum. The Dinosaur Provincial Park specimen was collected by Susan Owen-Kagen, a preparator in Professor Philip Currie’s lab at the University of Alberta. For Philip Currie, the Dinosaur Provincial Park specimen confirmed the the Montana fossil was a true and accurate representation of the dinosaur’s squamosal. In many instances, fossilised bones can become distorted and crushed as a result of the fossilisation process. The altered morphology can lead to a great deal of confusion when it comes to identifying characteristics. Pathology such as disease or damage to the bone that occurred when the animal was alive could also have led to the strange shape of the squamosal, however, with two squamosals from the right side of the skull being virtually identical there is a very strong probability that these fossils represent a new Chasmosaurine with a unique neck crest shape. 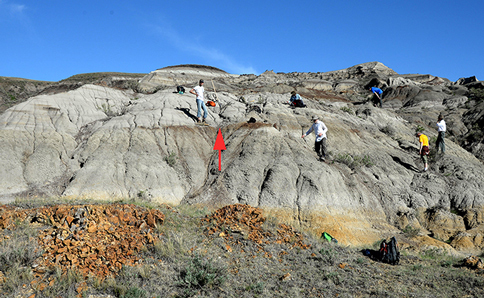 The red arrow in the picture highlights the Mercuriceratops layer. The wing-like flanges would have made a striking visual image, especially if the head and neck of these dinosaurs were brightly coloured. The horns too, although, undoubtedly used for defence and intra-specific combat would also have played a role in signalling amongst members of the herd. The Ceratopsians are spilt into two distinct groups, the Chasmosaurinae which were characterised by having long neck frills and in most cases short nasal horns but large brow horns. The second group are known as the Centrosaurines, or the short-frilled Ceratopsians. This does not mean that the frills on this group were small, most of the Centrosaurines had frills that were heavily augmented with spikes and horns. These dinosaurs tended to have short brow horns but with larger nose horns as a general rule. Both types of Ceratopsian were very common in North America during the Late Cretaceous and a number of different genera have been identified. Everything Dinosaur acknowledges the help of the press room at the Cleveland Museum of Natural History in the compiling of this article.